These are experiences you will never forget. In the heart of central Ohio’s Amish Country, the gorgeous rural landscape is crawling with oak, maple, and Ohio’s beloved buckeye trees hanging over narrow roads that meander through wavy fields of corn. 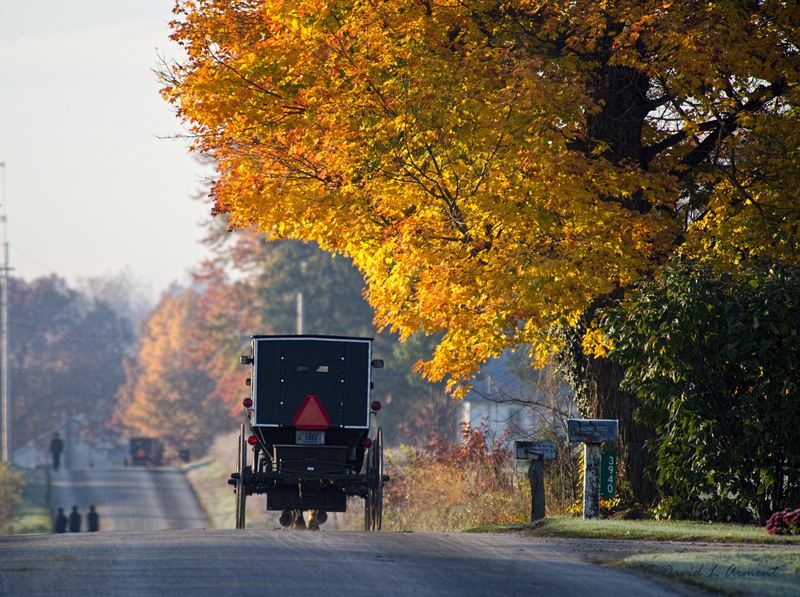 Drive under the boughs of bright reds and yellows, sharing the road with horse-drawn carriages of the Old Order Amish. From the moment you arrive, to the moment you leaf (pun intended), you’ll be able to enjoy some of the best fall foliage in the country. These are experiences that make lasting memories! The museum’s amazing collection of vehicles and T-related memorabilia is ever growing and changing. Among the stars are a 1909 touring (one of the very first Ts), a 1923 English-built town car, a 1925 fire truck, a 1927 coupe (one of the last Ts) and a 1931 Pietenpol airplane with a Model T Engine. There’s this little tiny town called Mt Hope and is home to many lovely Amish people . . Enjoy the pulse of the community, watch the Mt Hope Auction, shop the flea market or just people-watch! This is where the action is on Wednesday’s in the Amish country. Lehman’s is now world famous for its endless supply of non-electric goods. The 35,000 square ft. facility bills itself as a “Low Tech Superstore” reflected in its motto: “Simple Products for Simpler Life!” There is something for everyone from over 70 varieties of Root Beer to soap making supplies to cookware and candy. Visit the museum that features 3-dimensional deep-relief carvings in Butternut wood by Paul Weaver, a local Amish man. You will find a quaint, unique and tasteful shopping experience in a small, family owned country store. They carry bulk foods, deli meats & cheeses, fresh produce, and lots of snacks and other goodies. We will be given an Amish Quilting demonstration by Ada, the mother of 9 adorable children. She also makes candles and you will have a chance to visit her quaint shop. The Warther Museum, has been inviting guests in for over 50 years to learn and explore the essence behind Ernest Mooney Warther and his 64 ivory and ebony carvings, as well as his family home, his wife’s 73,000 piece button collection, and his original workshop. The 24-foot tall “World’s Largest Cuckoo Clock” was featured on the front cover of the 1978 Guinnes Book of World Records. The oompa band plays on the hour/half hour. Award-Winning family comedy variety show! Live theater and home of rib-ticklin’, side-splittin’, knee slappin’ variety show! Making cheese since 1935 and over 50 varieties of cheese produced with 100% local farm milk. They have been producing their signature Cheese Fudge for over 40 years. Have fun sampling jams, jellies, smoked meats, sauces as well as Fresh Roasted Peanuts. The smell when you walk in is absolutely HEAVENLY! Sooo many different breads/bakery items to sample. There is even popcorn & peanuts to try. Their donuts, fried pies & pastries are all phenomenal. Ever wonder how the ball gets inside the whistle? We will take a personally guided tour of the American Whistle Corporation, the only manufacturer of metal whistles in the United States. Experience candy making from start to finish in the 152,000 square-foot, state –of-the-art candy factory. View the huge copper kettles and their unique silver wrapped pipes that carry liquid chocolate throughout the factory. Enjoy shopping in their beautiful 2,500 square-foot retail shop. Uniquely situated inside the historical 2.5-mile oval track is recognized as one of the most highly visible museums in the world dedicated to automobiles and auto racing. Named one of USA Today’s top-three best sports attractions in the country. Established in July of 2011 is a family owned and operated business. An old world Tuscan feel where you can simply enjoy a beautiful day outside on the covered porch. Besides their selection of wines, they also offer sangrias, specialty craft beers and a broad range of liquor products for every palate.